This book is the most recent one I have read. It is about a girl who is a vampire. 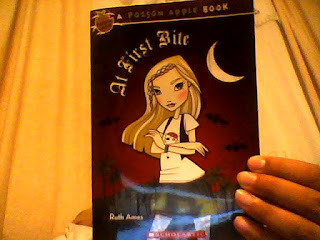 Ever since she became full-fledged vampire, things haven't been easy for twelve-year old Ashlee Lambert. After moving from New York City to Los Angeles, she is excited to make a fresh new start. But Ashlee never counted on a clique of popular mean girls or awful sunburns. Keeping her huge secret is suddenly harder than ever. And when something, or someone, starts attacking people at her school, Ashlee realizes she is not the only vampire in town. It was all up to Ashlee to figure out who they were before her cover is blown. This book is awesome for those of you who like vampire stories. It is very interesting and exciting at the same time. And I encourage those of you to read it. Thanks and please leave a comment. Hi Rita, you have me curious. Do you have a podcast about this? I would love to hear it.